Understanding how inflation works and its effect on assets is critical to investing and growing wealth. Even if you work very hard and save, if you are keeping all or most of your money in cash (or in a bank account), it will be difficult to grow wealthy because your money will be stolen by inflation each year even as it sits in a bank vault. This is why it is critical to buy assets that will grow in value faster than the rate of inflation if you are saving money for a long period of time. Today I thought I would discuss some concepts. But first, what is money exactly? Money is a marker – an IOU basically for some work that you did or something you dug up from the ground. Fundamentally, money is a way to store some work you did in order to be able to get someone else to provide the same amount of work in the future. If you are a farmer and grow corn, for example, and you needed a new tool, you might go and find a blacksmith selling the tool you need and trade some of the corn you grew for it. The price would vary, depending on how much the blacksmith wanted the corn and how much you wanted the tool, but basically the amount of labor the blacksmith put into making the tool would equal the amount of labor you put into growing the corn. Because you are better at growing corn and he is better at making tools, you each spend your time doing what you do well and trade rather than trying to produce everything you need by yourselves. Now it may be difficult to find a blacksmith who produced the tool you want who wanted corn, however. For this reason, money was invented as a way to make it easy to trade goods. If people trade what they produce to someone who wants it for money, they can then exchange the money with someone else who has the goods they need rather than needing to find someone who wants to make a direct trade. The free enterprise system makes this work almost by magic in that if someone produces something that someone else wants, they will be able to sell it, but if they make something others don’t want, then it will not sell. People soon learn to produce things that others want, and in the right qualities, so production eventually matches needs. Things that are the most needed sell the most and for the best prices, encouraging more people to make them. Originally money was made of things that were limited in availability – typically precious metals. The worth of the amount of the precious metal in the coin was equal to its value. For example, if people were willing to trade a day’s worth of work for an ounce of gold, they would be paid with a coin with an ounce of gold in it. Typically they would later give the coin to someone else for whatever goods they wanted to buy, but they could always melt the coin down for the gold in it if desired. Smaller value coins were made of silver and copper since these metals were less valuable and therefore a reasonable amount of the metal could be placed in a coin of low value. The beauty of this system was that there was no inflation. If you worked for a day when you were ten, you could save that coin and give it to someone else for an equivalent amount of work when you were seventy. There could be minor changes in prices depending on how scarce things were and if the precious metals became more available, but the value was still relatively fixed. It was nothing like today where a dollar you were given in 1940 might buy what was a dime’s worth of goods today. 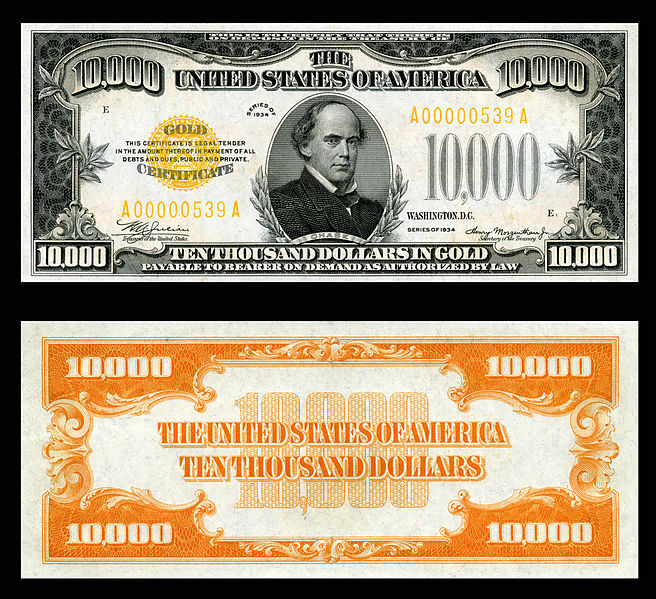 Note that to make it easier to carry, metal certificates, such as a gold certificate as shown below, were issued. This worked as well as making coins of the actual metal because people knew they could always exchange the certificates for the metal if desired. This limited the number that could be made as well since the government issuing them needed to be able to provide the needed amount of gold on demand. The US government (and other world governments) didn’t like this feature since it prevented it from spending more money than it took in through taxes, so it eliminated gold as a standard. This allowed it to start creating money as desired. This capability was actually given to the Federal Reserve, an organization created by the nation’s largest banks. The Federal Reserve creates money by creating cash (created out of thin air) and depositing it in the vaults of the member banks in exchange for fictitious bonds they hold. The Federal Reserve does the process in reverse to destroy money by creating new bonds and forcing the banks to buy them with their cash. Because dollars are being created without and then released into the economy without any actual labor being traded for those dollars, the value of all the currency declines when more cash is injected intot he economy. If you put in an hours work for $5 in currency, but then someone else shows up with $20 in newly printed bills, the next person may demand $7 for that same amount of work. Because there are now more dollars in the world, the labor and goods purchased are worth more of the dollars used to purchase them. So, if there were no inflation, if when you were young you worked 20 hours more per week than you needed to take care of your basic needs and kept the extra cash in a cookie jar, you would have several thousand hour’s worth of work built up when you retired. You could then trade those “work vouchers” for the work of others when you were no longer able to do things for yourself. Someone else would grow crops for you instead of you needing to till the land yourself. So, after 40 years, you would only get back 45 cents on the dollar from your savings. Even after about 5 years, you lose 10 %. So, to keep this from happening to your savings, you need to buy things that will go up in value at least at the rate of inflation. If you are putting the money away for a long time and won’t be able to touch it (like you are burying it in a mason jar), things like gold and silver will work. Over shorter periods of time, however, speculation causes their value to change unpredictably. Real estate is also a possibility, but some of the value will be lost to property taxes and maintenance each year, so rental income must be generated to avoid loss of value over long periods of time. Probably the best way to preserve value with minimal effort is with common stocks. As inflation makes dollars worth less, the assets of a company – including its ability to make more money through its brands and systems – increases. Better than just keeping their value, stocks tend to earn more than inflation since the size, and therefore the value, of businesses tend to grow. The only downside is that the value of equities may decline if held for short periods of time. If you hold a diversified set of stocks, whether the value will be higher or lower than you paid over a 3 year period is anyone’s guess. Over a period of 20 years, however, the value is almost guaranteed to be higher. So, if you need money in a short period of time – like within a few years, say – keeping money in cash assets like bank accounts or bank CDs is the best option. Holding money for five years or more, however, requires protection against inflation. Real estate, precious metals, and stocks are the best options. Of these, stocks are generally the best option of the three with little effort and more predictable returns. Money to be saved for a long period of time should therefore be placed in a set of individual stocks and/or mutual funds. Contact me at vtsioriginal@yahoo.com, or leave a comment. * Image courtesy of the National Numismatic Collection at the Smithsonian Institution. Previous When is it Time to Diversify Your Investments?